You’d be forgiven for thinking it was never going to happen… but it has… the first RAGE Session is finally here! The post-TTM era: homeopathic hypothermia or aggressive normothermia? Dumas F, et al. Is hypothermia after cardiac arrest effective in both shockable and nonshockable patients? : insights from a large registry. Circulation. 2011 Mar 1;123(8):877-86. PMID: 21321156. Jacobs IG, Finn JC, Jelinek GA, Oxer HF, Thompson PL. Effect of adrenaline on survival in out-of-hospital cardiac arrest: A randomised double-blind placebo-controlled trial. Resuscitation. 2011 Sep;82(9):1138-43. doi: 10.1016/j.resuscitation.2011.06.029. Epub 2011 Jul 2. PMID: 21745533. Nehme Z, Andrew E, Bernard SA, Smith K. Treatment of monitored out-of-hospital ventricular fibrillation and pulseless ventricular tachycardia utilising the precordial thump. Resuscitation. 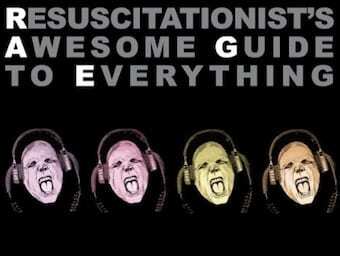 2013 Dec;84(12):1691-6. doi: 10.1016/j.resuscitation.2013.08.011. Epub 2013 Aug 27. PMID: 23994203. Septic and hypotensive: now what?